Nuu-chah-nulth First Nations have completed Marine Traditional Knowledge (MTK) mapping activities to record valuable Traditional Ecological Knowledge about areas that are important to Nuu-chah-nulth communities and culture. 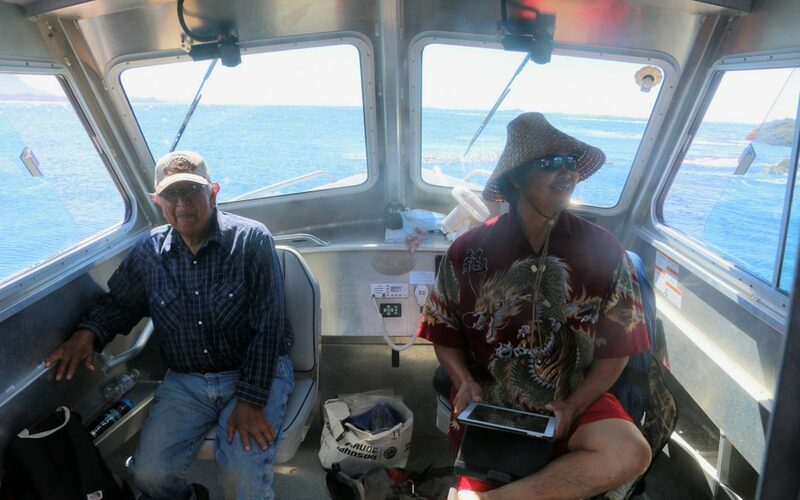 Over the course of the project Luc Bibeau worked as the Uu-a-thluk MTK Mapping Coordinator and met with members of 13 Nuu-chah-nulth First Nations to gather cultural information and record and map marine habitat that is important for fish, food, culture, and the spiritual well-being of the Nations. NTC Directors and the Council of Ha’wiih Forum on Fisheries approved this project, recognizing it as an important tool for marine habitat protection. “Putting data-sharing protocols in place between Nuu-chah-nulth First Nations and Canada is an important safeguard in the event of a marine catastrophe such as an oil spill,” said Bibeau who conducted interviews and mapping workshops for the project in Nuu-chah-nulth Ha-ha-houlthee from October 2015 to March 2017. “With protocols in place, federal agencies responding to a major catastrophe, such as an oil spill, will have quick access to the data provided by each Nation so they may prioritize actions for protecting marine habitat critical to the Nation,” said Bibeau, adding that MTK data and maps will remain with—and be under the control of—each individual Nation. As part of the project Bibeau interviewed fifty-two knowledge holders with experience on the water, fishing, and harvesting shellfish, hunting birds, and marine mammals. Interviewees identified key harvest and cultural sites and critical habitat, including spawning grounds and sensitive shorelines. They noted changes in aquatic resource abundance and the broader ecosystem over time, as well as cultural sites that could be adversely impacted by a marine disaster or by the human response to a marine disaster. MTK data were verified by field visits to significant ecological and cultural sites with discussions around the importance of each area (e.g., river estuary, shellfish beach, sea lion haul-out) and its role in the health of the overall ecosystem. Knowledge holders accompanied the Mapping Coordinator (MC), GIS Technician, and youth from their respective communities during the field visits to share their knowledge of marine species and how their communities would sustainably harvest marine resources. These visits incorporated training on how to use handheld- and boat-mounted GPS units to help interpret the spatial data gathered during knowledge holder interviews by taking GPS points, particularly at marine mammal sites and cultural areas that could be impacted by an oil spill response. Additionally, fifty six Nuu-chah-nulth community members were trained to use GPS units to record data points for significant ecological and cultural sites in the field and learned how to export GPS points, tracks and descriptive data into Google Earth Pro for mapping purposes. Throughout the project the communities helped to develop 106 print and digital maps organized in individual data layers showing as examples, shellfish harvest sites, herring spawning areas, salmon bearing streams, rearing areas and fishing areas, ground fishing areas, sea mammal sites, and important marine bird habitat for each Nation to access.